Our monthly eNewsletter consistently ranks as our most popular feature! I just want a patient e-Newsletter. Yes, the Perfect Patients monthly eNewsletter consistently ranks as our most popular feature. It’s a lot of work to research, write, find photos, publish and broadcast a monthly patient newsletter. We know. We’ve been doing it for over 10 years! Unlike other eNewsletters, the Perfect Patients eNewsletter resides on each client’s website. 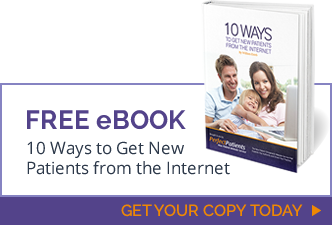 This generates additional website traffic (helpful for search engine ranking), increases the likelihood of forwarding to a friend, plus improves the probability of patients exploring other parts of our clients’ websites. Unfortunately, this level of integration prevents us from separating our eNewsletter from our website service. We offer so much more than a patient newsletter. The most essential new patient generating features are listed here.